Sharing Dance Seniors classes are designed to promote health and inclusion for participants. BRANDON – No experience is required to participate in the Baycrest NBS Sharing Dance Seniors program, an exciting social opportunity for seniors that includes people living with dementia and their caregivers in the Westman Region. The program is returning for the third phase of a research project being conducted in partnership with Brandon University and Trent University. 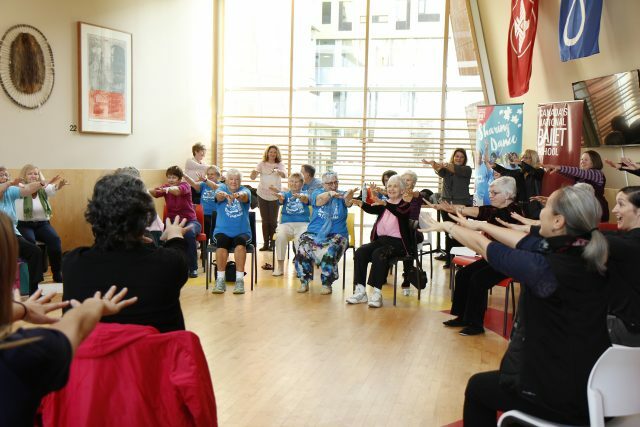 The Sharing Dance Seniors program is being provided to the public at no cost by Canada’s National Ballet School (NBS), in partnership with Baycrest, at three locations, starting the week of April 22. An information session will take place at 10 a.m. on Wednesday, March 27 at the Minnedosa Personal Care Home, which can be reached at 204-867-2569. Herron is excited that the Baycrest NBS Sharing Dance Seniors pilot program is returning to the Westman Region and is now more accessible. She believes the program has the potential to help change the way people perceive those who are living with dementia. The innovative pilot program is expanding across Ontario and Manitoba at rural sites, including personal care homes. Personal Care Homes in Carberry and Minnedosa are opening their doors to the public and welcoming all seniors to join classes in the spirit of social inclusion. Baycrest NBS Sharing Dance Seniors offers an eight-week series of seated dance classes with intended benefits for health and social inclusion and will begin the week of April 22. Wednesdays at 10:30 am (Starting April 24): Minnedosa Personal Care Home, 138 3rd Ave SW. Contact: 204-867-2569. About Baycrest NBS Sharing Dance Seniors Developed by Baycrest and Canada’s National Ballet School (NBS), Sharing Dance Seniors is a safe and accessible dance program that engages older adults in meaningful dance activity that benefits physical, cognitive and overall health. As part of the initiative, NBS launched a pilot programme with Baycrest in autumn 2017 to bring dance to seniors in the Peterborough-Kawartha region of Ontario – one of the fastest aging rural regions in Canada – and will be piloting the program in the Westman Region in fall 2018 and spring 2019. With the goal of providing the highest quality dance programming for seniors, the pilot utilizes video-streaming technology to help instructors from NBS teach classes from the studio in Toronto and deliver them to the community.